The Direction Of Play is a book by Kajiwara Takeo. First published 1979 by the Ishi Press, a translation by John Fairbairn of Go Super Books volume 12 from the Nihon Ki-in series. The book was reprinted by Kiseido. In the English versions of the book, the author's name is in the Western order (given name, then family name), Takeo Kajiwara. Over six discussion chapters, a problem section and a detailed game analysis, we have Kajiwara's theory - 'a stone has power', 'move two lost the game', 'living go', 'no real improvement unless you ...'; and so on. This is an artistic rather than a technical theory of go. Or the master chef bawling out the kitchen underlings for lack of committed perception. Charles Matthews: Plenty of interesting ideas here. I don't know where one does pick up the concept that good go depends on feeling. Some people might find it in these pages. JohnAspinall : Man, this is the go book I love to hate. My reaction is that of Halfling's, only squared. The very first time that the concept of the direction of play is mentioned, out comes one of those "It's clear that ..."; and I want to scream "No! Dammit, it is not clear! I wouldn't be reading Chapter 1 of your book if it was clear. Have you no respect for your readers at all?" Now intellectually I know that I am applying a left-brain analytic approach to what is a very right-brain "feeling" presentation; not to mention the cultural nuances lost in translation, but if there is a single go book that drives me up the wall, this is it. HolIgor: It is definitely a dan level book. High dan level, even, as it discusses planning the game as a whole. I remember Kajiwara saying "Give me this ponnuki and I won the game". Man, you gave your enemy 20+ points of territory for this ponnuki and you've won the game!? Malweth: I like to think of this book as: read this book, but ignore it. It may be useful at the strong SDK level if only read with the subconscious. Move Two Lost The Game. Willemien: in Chapter 3 (Move Two Lost The Game) Takeo Kajiwara mentions a nameless professional go player who, when he was carefully scrutinising one of his games, said: "Move two lost me the game". Kajiwara gives as perfect [sic] follow up after and move . 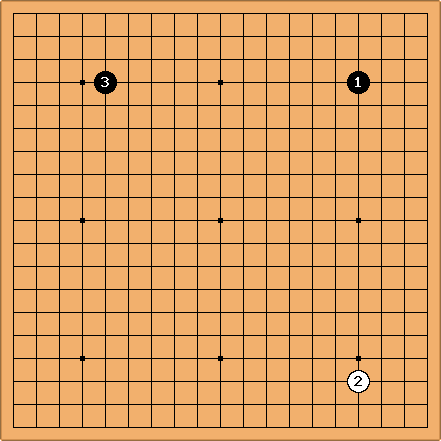 I did a combined search in the Gogod and the SmartGo/Mastergo databases and found a total of 162 games in which move and are played, but in none of them I could find a game in which move 3 is at . Does anybody know of a game between professional players where after and , is played? Bob McGuigan: Kajiwara is well-known for his exaggeration and sarcasm. He does say that he "can't actually vouch for its veracity", referring to the story of the pro who said move 2 was the losing move. Bob McGuigan: The fact that out of some 50000 pro games only 162 have the - combination strongly suggests that is not a very good response to . Since is hardly ever played in response to it isn't surprising that it is hard to find a pro game with at takamoku. This book is about direction of play and one aspect of that is making your stones work together. It is also good to be the first to play in an empty corner. on the star point means that after in the lower right a Black move at either of the points marked a is especially good, since the approach move works well with the star point stone in the upper right. After the approach moves become even better for Black since all three black stones are working well together. So White might want to play at one of the a points himself with . But that would then allow Black to play first in the lower left corner, getting the first move in three corners. If White plays in the lower left then Black gets to make a great approach move to the lower right white stone. So White is faced with no good place to play after . This is an incomplete analysis of the situation, and of course, Kajiwara is thinking at a high level, so making use of the advantages or disadvantages might be difficult for us weak amateurs. But having this kind of thinking in mind will put us on the right track to getting stronger. Bob McGuigan: I thought there was such a discussion, too, and I wanted to refer to it but I couldn't find it right away. As for any 3-4 move for being less than optimal, White could force Black to play a diagonal fuseki by playing the other 3-4 in the lower right - that is, if Black insists on using the "good" approach from a corner star point. I haven't thought how that would work out but, psychologically at least, some people don't like to play diagonal openings, so that might inhibit Black.